They say that when you love someone, time stands still. However, if time has rushed by and you find yourself on the eve of Valentine’s Day, it’s time for last-minute solutions! But this shouldn’t mean that you rush to the store and get an impersonal card or gift; after all, nothing beats a handmade card to be gifted to your loved ones! And because it’s the season of love, we’ve got not one, not two, but three ideas for last minute Valentine’s Day Cards – read on! Cut out a heart shape from thick cardstock. 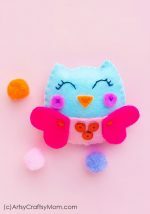 Cut out small strips of ribbons in vibrant colors and use fabric glue to stick them across the heart till it’s completely covered. It’s okay if the ribbon strips go beyond the heart shape. Let it dry completely. Once the ribbons on the heart are dry, cut out the extra ribbon dangling at the ends. Once done, you will have a lovely ribbon covered heart shape! Mount this colorful heart on a plain card and decorate with embellishments of your choice. That’s it – your card is ready!!! 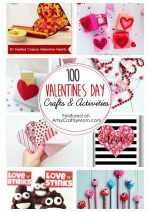 Take a square piece of card stock and cut out a heart shape in the middle. I traced the heart shape in the middle and then cut it out using a paper craft cutter. Take an acetate sheet and cut out a square shape, ensuring that it is slightly larger than the card with the heart cutout. Apply double-sided craft foam all around the heart, making sure that it isn’t visible when the card is turned over. Now, take the card on which this panel will be struck and before sticking it, Place a few sparkle beads carefully in the middle of the heart. Position the heart panel correctly over the second square card and press down firmly on the foam so that the beads stay inside the base card. Your shaker card is ready!!! Take a piece of cardstock and color it using your choice of watercolors. I opted for a yellow color and continued to add additional colors. Let it dry completely. 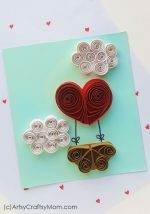 Once the cardstock is dry, cut out small hearts and fold them into halves. Apply glue on the plain sides of two watercolor hearts, and stick them together so that only the painted sides are visible. I stuck four hearts together to make one 3D heart balloon; make two such balloons. Stick the balloons on to a base card and draw strings to make them look more like heart-shaped balloons. Now, that’s easier than it looks, right? 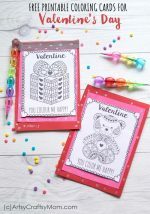 With such simple yet stunning cards, there’s no excuse not to make them for Valentine’s Day; you can’t even say that you don’t have time! 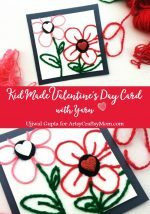 These cards require very basic supplies and very little time; so gather the kids together and get crafting!